This title will be released on May 6, 2019. Twenty years after the events of Iron Sky, the former Nazi Moonbase has become the last refuge of mankind. Earth was devastated by a nuclear war but buried deep under the wasteland lies a power that could save the last of humanity or destroy it once and for all. The truth behind the creation of mankind will be revealed when an old enemy leads our heroes on an adventure into the Hollow Earth. To save humanity they must fight the Vril, an ancient shapeshifting reptilian race and their army of dinosaurs. In 1945 the Nazis flew to the Dark Side of the Moon, and established a secret hideout, where they've been preparing for their grand return. The year is 2018, and the Americans return to the Moon in search for powerful energy source, Helium-3. They end up landing too close to the secret Nazi fortress, and although the big Nazi weapon Götterdämmerung is not yet ready to be deployed, soon the skies are full of iron, as the Nazi war machines take a pre-emptive move against threat from Earth. 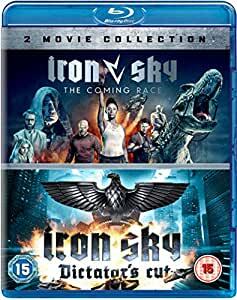 The DICTATOR'S CUT of Iron Sky is an all-new take on the film, following the original vision of the director Timo Vuorensola. This version is 20 minutes longer, loaded with new visual effects, new music from Laibach - and, of course, tons of new, politically incorrect humour. IS1: Featuring 20 minutes of additional footage and 75 minute Making of Iron Sky including bonus material & behind the scenes footage.